Is Guangdong Zhenrong in financial problems? 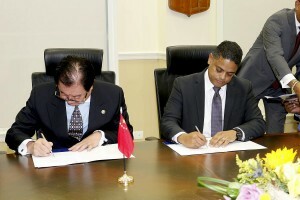 WILLEMSTAD - A recent article published by Splash24/7, mentioned that the Chinese State Oil Company Guangdong Zhenrong Energy (GZE), which is at the front of the negotiations of the acquisition of the oil refinery in Curaçao, is in financial problems. The article refers to the company Titan Petrochemicals which announced that the High Court of Hong Kong has ordered to wind up the company’s controlling shareholder Guangdong Zhenrong Energy. This was done according to petitions filed by Industrial Bank. Guangdong Zhenrong Energy took over the financially troubled Titan Petrochemicals in 2012, and held shares in that company through its wholly-owned subsidiary Fame Dragon International Investment, which was ordered to be wound up by the court in May. According to Titan, Guangdong Zhenrong expressed its intention at the end of 2016 to continue supporting the company in terms of business development and financial support, and therefore the wind-up order may have material adverse impact on the company’s business operation and financial position. In a recent interview with the Dutch newspaper Antilliaans Dagblad, the Prime Minister of Curaçao Eugene Rhuggenaath indicated that he is aware of these problems facing Guangdong Zhenrong Energy. Furthermore, Rhuggenaath has called for further investigation, through diplomatic channels, for example, via the Foreign Relations Directorate (DBB) in Willemstad and the Ministry of Foreign Affairs in The Hague. “I emphasize that due diligence must be carried out very accurately to ensure the continuation of both projects.” The Minister was referring to the LNG terminal and acquisition of operation and modernization of the refinery after 2019 as the agreement with the Venezuelan PdVSA ends.